The Chicago Bears fired coach Lovie Smith on Monday December 31 after the team missed the playoffs for the fifth time in six seasons. Smith was informed of the decision by general manager Phil Emery on the day after the Bears beat Detroit to finish 10-6 but still didn't make the playoffs. Smith led the Bears to a Super Bowl, but also saw his team collapse in the second half of the past two seasons. 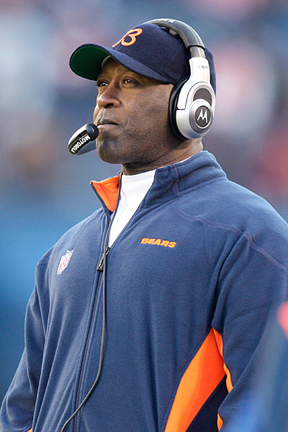 Hired in 2004, Smith led the Bears to three division titles, two NFC title games and a 2007 Super Bowl appearance in his nine seasons. His record is 81-63, and he leaves with one year left on his contract. The Bears scheduled a news conference Tuesday to discuss the move. Even though Chicago closed with a win, the Bears needed a loss by Minnesota to get into the playoffs. The Vikings, though, beat Green Bay to clinch a postseason spot, leaving Chicago as the second team since the postseason expanded to 12 teams to miss out after a 7-1 start. The other was Washington in 1996. Smith's record ranks third on the Bears' all-time list, behind George Halas and Mike Ditka. The highlight of his tenure was the run to the title game that ended with a loss to the Indianapolis Colts. It was the first time two black coaches met for the championship, with Smith going against his mentor Tony Dungy. The Bears made the playoffs just three times and posted three postseason victories under Smith. The 2010 team beat Seattle after the Seahawks won their division with a 7-9 record, but the Bears lost to Green Bay in the NFC title game at Soldier Field. There was speculation Smith would be let go following the 2011 team's collapse, but he got one more year while general manager Jerry Angelo was fired. Ultimately, the struggles on offense did him in. Known for solid defenses, Smith oversaw a unit that was consistently effective and at times ranked among the league's best with stars such as Brian Urlacher, Lance Briggs and later Julius Peppers. Smith emphasized taking the ball away from the opposition, and no team did it more than the Bears with 310 during his tenure. But on the other side, it was a different story. Smith went through four offensive coordinators in Terry Shea, Ron Turner, Mike Martz and Mike Tice. He never could find the right formula, even as the Bears acquired stars such as quarterback Jay Cutler and receiver Brandon Marshall over the years. The offensive line has struggled in a big way over the past few seasons after age took its toll on a group that was a strength during the 2005 and 2006 playoff seasons. The Bears were never able to replenish, spending first-round picks on Chris Williams (2008) and Gabe Carimi (2011) that did not pan out. Williams had his contract terminated in October, ending a disappointing run, and Carimi struggled this season after missing most of his rookie year with a knee injury. While Angelo took the fall after last season, Smith was not without blame in the personnel issues over the years. He pushed to bring in former Rams offensive lineman Orlando Pace and safety Adam Archuleta, players who succeeded in St. Louis when Smith was the defensive coordinator there but were busts with the Bears. He had no bigger supporter than team matriarch Virginia McCaskey, but the fans seemed split on him. To some, he was a picture of calm, a coach who never lost his composure and never criticized his players in public, the anti-Ditka if you will. History suggests fans who are clamoring for a high-profile replacement such as Bill Cowher or Jon Gruden might be disappointed. The last time the Bears went with an experienced NFL head coach was when Halas returned to the sideline in 1958. They might, however, go with an offensive-minded coach for the first time since Mike Ditka was fired after the 1992 season, given the issues in that area. That the Bears would be in this spot seemed unthinkable after they ripped Tennessee 51-20 on Nov. 4. They were sailing along at 7-1 and eyeing a big playoff run after collapsing the previous season, with the defense taking the ball away and scoring at an eye-opening rate to compensate for a struggling offense, but the schedule took a tougher turn. They dropped back-to-back games to Houston and San Francisco and five of six in all before closing out with wins at Arizona and Detroit. Injuries mounted along the way, and what looked like a playoff run slipped from their grasp, just as it did after a promising start in 2011. That year, they won seven of their first 10 only to wind up at 8-8 after a monumental collapse sparked by a season-ending injury to Cutler. While Angelo was fired, Smith got spared and Emery took the job with a mandate to keep the coach at least one more year. He quickly went to work retooling the roster, landing Marshall in a blockbuster trade with Miami that reunited Cutler with his favorite target in Denver. He also added depth in other areas, bringing in Jason Campbell as the backup quarterback after Caleb Hanie failed the previous season and teaming running back Michael Bush in the backfield with Matt Forte. All those moves sent expectations soaring. The results were awfully familiar, though. Now, Smith's out of a job.